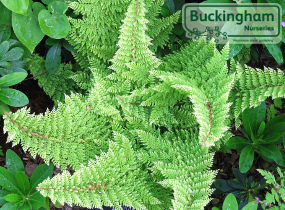 Handsome evergreen fern with mid-green deeply divided fronds which retain their colour throughout winter. Young fronds are a paler golden green turning slowly to mid-green. Mature fronds covered with pale brown and white scales. Height 2-3ft (60-90cm), spread 3-4ft (90-120cm).